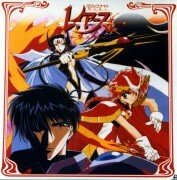 This image appears on page 102 of the magazine "CLAMP Newtype - Platinum;" the first in a series of two special publications of Newtype magazine showing a retrospective of CLAMP's works from their early days right up to today (the second edition is called " CLAMP Newtype - Pastel"). 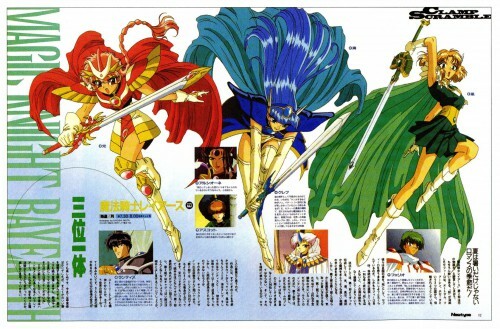 This image of the three Magic Knights in their full battle attire originally appeared in the July 1995 edition of Newtype Magazine, to co-inside with the broadcast of the second season of MKR anime series. I just so happen to own a copy of the July 1995 edition, which I bought from the Hondarake Japanese Book Exchange in Sydney about 2-3 years ago. A very rare-to-find image as well, but I am sure you will all enjoy. oh wow great scan thanks for uploading it! Esta imagen esta sacada de una revista. Genial! genial me encanto el scan! nice! I love this sooooooo much! excelent image, very that scan with progres. thanks"